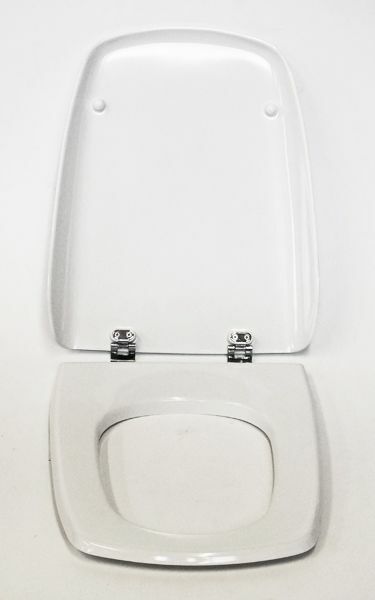 Original Ideal Standard Accent (Aero) 7.4050-1 toilet seat and lid in White with chrome-plated metal fittings. This is a genuine factory original from Ideal Standard, brand new and boxed, designed exclusively to fit the Accent range of toilets produced in the 1980s and 1990s. This range is also know as the Aero in other European countries. Width 370mm at back, 270 mm at front. Price above excludes delivery - available for collection from our warehouses in Churt, Surrey GU10 2LN or Risca, Gwent NP11 6GQ or can be securely packaged and sent by carrier for an additional charge. For UK mainland addresses add £15.00, Scottish Highlands add £25.00, Northern Ireland add £36.00, Southern Ireland add £45.00. For delivery to other locations please contact the office for a quote prior to placing an order. Please note: this will ONLY fit the Accent/Aero range of toilets by Ideal Standard - the shape and mountings are specific for that particular range. If in doubt please contact us on 01428 608164 or by email to email@brokenbog.com.